If you fancy braving Eurostar and Paris smog, you might take a decko at Art Paris Art Fair, which opened at the Grand Palais yesterday. The official website has a dodgy script, so I won't direct you there. 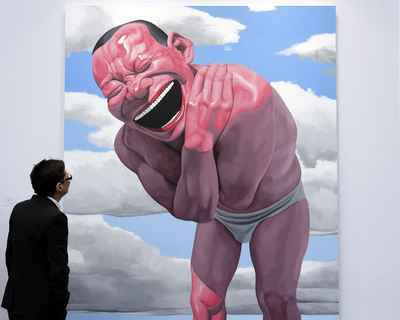 Shown is a large 3D painting by Chinese artist Yue Minjun: Blue Sky and White Clouds. The figure has been painted with a loincloth for Paris prudes. CLICK for ArtDaily.